Why does it matter which backpack I have for college? We have painstakingly researched the best backpacks on the market in 2018, to find the best backpacks to fit the requirements of the modern college student lifestyle to make sure that get the most bang for your buck. When you are looking for the best backpack for college, you should always consider the volume of the bag that you need. The volume of the backpack is usually measured in liters, a small backpack would be around 10 liters, whereas a larger backpack would have a volume of 20-30 liters. There are backpacks that hold far more than this but these will generally be to big for college use. 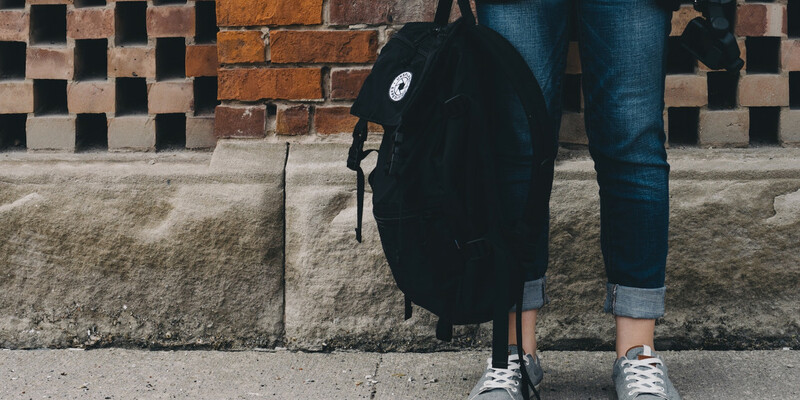 If you are carrying your backpack around college all day, then it is very important that your backpack is comfortable, especially if you will be carrying around heavy textbooks and a laptop. Make sure that the backpack that you buy has adequate padding on the straps and the back. You may be a fashion conscious person, or you may not be, but it is still great to have a stylish backpack if it fits your requirements. 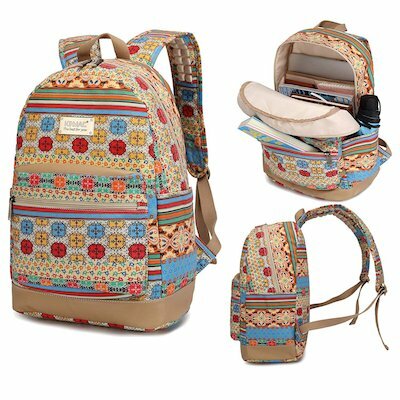 Below you will find some stylish backpacks that still have all the functionality that you will need for college. Does it have enough pockets, would you be happy to put your shiny $2000 new mac in there? These are all important questions when looking for the best backpack for college. Most people these days will be taking laptops to college, so a laptop sleeve inside the backpack is important for college students. One of the most important things about backpacks is will it last? College life can be punishing on backpacks as students are often carrying around heavy textbooks and laptops. There are many good materials that you should look for in your college backpack. Leather is fantastic for it’s durability and style, canvas is eco-friendly and has a nice vintage look, but if you are looking for build quality then ripstop nylon is great. 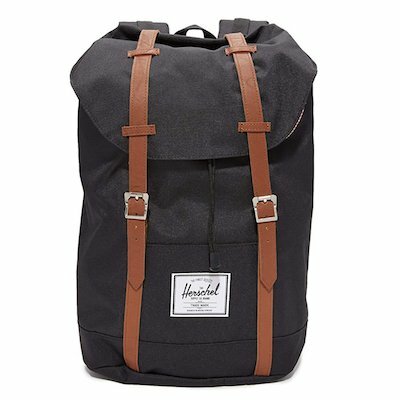 Herschel Supply Co backpacks are extremely popular at the moment in colleges all across the country and it is easy to see why. These backpacks are stylish, comfortable and compact. Rather than using zips like most backpacks, The Herschel Supply Company decided to go with straps, which I think is a great idea considering how often zippers get stuck on bags! The flap on top of the bag that protects your valuables from the elements is fastened using a magnetic clip and conceals a large opening which makes it easier to pack and unpack your stuff. On the inside of the bag there is a laptop sleeve, however it could do with more some more padding. The size of the bag is 19″X12″X6″ which should be enough room for most people. 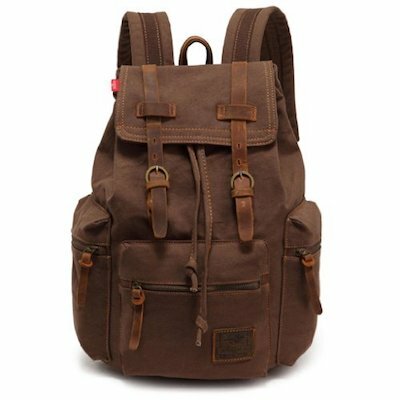 The EcoCity Vintage Canvas Backpack is fantastic for college students who want a bag that is eco-friendly, stylish, comfortable and affordable. The bag is available in five visually appealing colors; coffee, army green, khaki, grey and black. One of the best things about this bag is it’s eco-friendly credentials as the backpack is made of cotton canvas and leather, rather than the synthetic materials that most backpacks these days are made from. The main compartment of the bag uses leather straps to close the flap on the top and has a draw string to make sure that it is tightly closed. While it not the largest backpack around (11″L x 16.5″H x 6.3″ W), it should be fine for most people. Though if you have a larger laptop you may have difficulty fitting it in. The unique design on this backpack guarantees that you will stand out from the crowd on campus! Like many of the backpacks I have reviewed, this one also has a padded laptop sleeve that can hold up to a 15 inch laptop. It has ample space for your laptop and books and has the added benefit of what Kinmac call “massage cushion straps” which are textured straps to give you extra comfort when you are carrying heavy loads in the bag. This backpack has lots of pockets on the inside and out, including pockets on the sides of the bag for drinks bottles. This is another popular backpack in colleges at the moment, and it’s many five star reviews show how great a backpack it is! 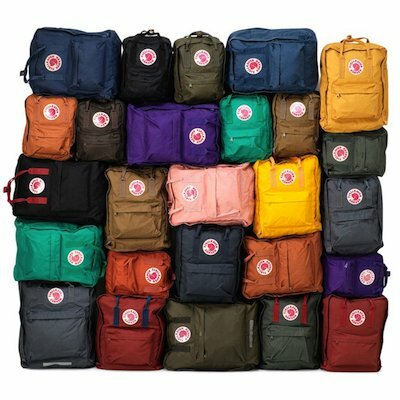 With multiple colors and sizes to choose from, you can make sure that it looks how you want it to look and can hold everything that you will need to take with you to college, whether you just need a small backpack to carry around your macbook air or you need to carry around big heavy college textbooks. This is a high quality, well-made backpack with a stylish, minimalistic & retro look. The straps are comfortable and well padded, so this is a great backpack to wear all day without having to deal with the the shoulder pains that often appear towards the end of the day with some backpacks. The main compartment has a laptop sleeve to keep your laptop safe and there is also a small pocket on the front of the bag to keep smaller items that might get lost in the larger main compartment of the backpack. This bag isn’t cheap, but you really get your money’s worth as this backpack has a fantastic build quality. Such an awesome name that I’m not sure how to pronounce it! While not the most stylish backpack out there for the fashion conscious college student, this backpack offers great bang for your buck. It’s clear that when Amazon designed this backpack, they had college students in mind. This bag is roomy, with a padded space for laptops that are up to 17 inches in size, organizational compartments for your keys & cellphone and the bag also has mesh pockets on the side of the bag so that you can take your water bottle or your protein shaker bottle to the campus gym! Internally the bag has dimensions of 12″ x 4.5″ x 17.5″ so you should be able to fit a few textbooks as well as your laptop. Roomy, lots of space for those college textbooks! This is the backpack that I am currently using! This backpack can hold up to 28 liters of your stuff, but still remains fairly compact, making it ideal for college. It also looks nice and is available in a huge variety of different colors, so you will almost certainly find one to fit your personality. 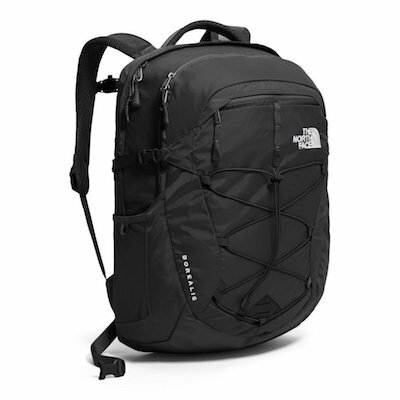 The North Face Borealis Backpack has a laptop sleeve that can fit laptops up to 15 inches in size, which should keep your laptop safe around college, two main compartments and one smaller compartment. There are also a lot of smaller pockets inside the main compartments that are useful for safely carrying around smaller items such as your phone. There is also an elastic bungee to expand the bag’s storage beyond the initial 28 liters, this can be useful for carrying something like a bike helmet or your jacket. You can also carry water bottles in the mesh pockets that are on the side of the backpack. The padded shoulder straps on this backpack are very comfortable and also have some mesh lining for breathability. There is lots of padding on the back of the backpack which prevents back pain when carrying heavier loads. You will also find a chest strap and a waist strap to increase the stability of the bag when you are moving quickly. So How Can I Decide on the Right Backpack for Me? What do I need to keep in my backpack? This is probably the most important question. Do you need to carry a laptop? A backpack with a laptop sleeve is important. Lots of big, heavy college books? Then you need to make sure that you buy a backpack that is large enough to fit them in and in comfortable enough so that you do not hurt your back then carrying them. If you don’t need to carry a lot around with you at college then you can go with one of the smaller or more stylish backpacks. If you are not sure, then ask a professor what you are likely going to need to take with you to class every day, or look at what other college students in your class are using. You can also click on the links to each of the backpacks above and view the Amazon reviews, where many people leave reviews explaining what they have been able to fit into each of the backpacks. 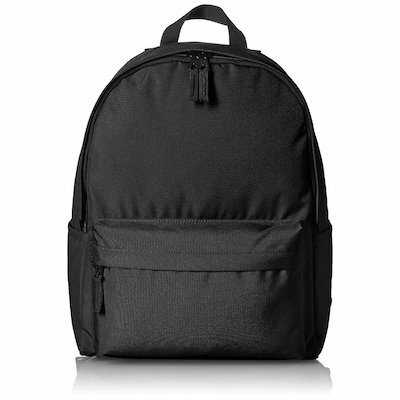 If you don’t have much to spend then the Amazon Basics Backpack is probably the best one to go for as it is good quality and very cheap, but if you have a larger budget then we would easily recommend the Herschel. How important is style to me? For some people, style will be the most important thing that they look at when looking for a backpack for college, whereas other people won’t worry about style at all. Most people fall somewhere in between. Generally, if you want a stylish backpack, you will end up paying more for it, though it can be worth it in the long run as they stylish backpacks are often well built and can last longer. If you are not too worried about how stylish the backpack is, you can often get a backpack with more functionality such as extra pockets or more padding or a similar price to a stylish backpack with less functionality.